Guitarist Andrew Hardin and vocalist Jeannie Burns have teamed up to write, record, and perform as Hardin Burns. After meeting at Woody Guthrie Folk Festival in 2009, the two began writing what would eventually become their self-released debut recording “Lounge” in 2012. Jeannie Burns is one of twelve children born to the mayor of Binghamton, New York, and her mother was an amateur classical singer who taught her children to sing. During the 1980s, the Burns Sisters initially made several major label recordings as a pop music group with 5 sisters. During the nineties they downsized to 3 sisters and had a long tenure on the Rounder label as a folk-pop group. As a member of the BurnsSisters, she has sung on recordings for many artists such as Jimmy LaFave and done two tours as back up singer for Arlo Guthrie. In the year 2000 she recorded her own excellent solo album Coming Up Close, which featured songs by some of the best contemporary writers such as Ray Bonneville, Fred Eaglesmith, and Steve Earle. Jeannie is the principal lyricist and vocalist in Hardin Burns, and her unique voice and stylistic orientation make her the perfect musical partner for Andrew. Hardin Burns has already done a substantial amount of touring in the US, and also in Canada, Italy, and the Bahamas. What sets Hardin apart from the crowd is their ability to combine traditional musical styles such as blues and country with visionary, modern lyrical ideas. Their sound brings to mind such acts as Raising Sand or Civil Wars. Influences include Johnny Cash, Howlin’ Wolf, Lucinda Williams, Warren Zevon, Al Green, the Rolling Stones, and George Harrison. 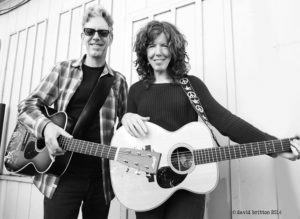 In live performance, expect to hear Jeannie’s evocative, bluesy vocals framed by Andrew’s inspired and inventive guitar playing.